Wright & Schulte LLC is currently representing numerous women from across the country in vaginal mesh lawsuits and continues to speak with women who have purportedly experienced side-effects from bladder mesh and pelvic mesh implants. For a free legal consultation contact one of the product liability attorneys at Wright & Schulte LLC by calling 1-800-99-0795 or visit http://www.yourlegalhelp.com for more information and updated news on bladder mesh implants. In addition to Bergen County Superior Court, C.R. 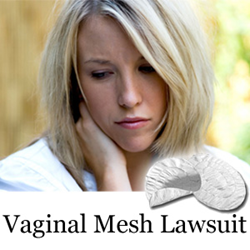 Bard has bladder mesh lawsuits pending in the U.S. District Court, Southern District of West Virginia. Bloomberg News reported that U. S. District Judge Joseph Goodwin, who is presiding over the coordinated proceedings for the mesh lawsuits, made an unusual move by telling Bard’s attorneys that Bard could possibly lose billions of dollars in jury verdicts if the company chooses not to settle the mesh complaints for a lesser amount. Judge Goodwin reminded the company of the large verdicts that juries have recently awarded women who claim they were injured after using the company’s mesh products. Wright & Schulte LLC, an experienced personal injury firm, is dedicated to the belief that America’s legal system should work for the people. Every day, the attorneys of Wright & Schulte LLC stand up for the rights of people who have been injured or wronged and fight tirelessly to ensure that even the world’s most powerful corporations take responsibility for their actions. If you’re looking for a law firm that will guarantee the aggressive and personal representation you deserve, please do not hesitate to contact Wright & Schulte LLC today. Free transvaginal mesh lawsuit case evaluations are available through yourlegalhelp.com or by calling 1-800-399-0795.